Check DNS propagation from two dozen different root locations. Enter your host below and select the test location(s). Having network issues? Sign up to monitor your network services for the next 30 days for free. Try our - Network Monitoring services and quickly troubleshoot the root cause of your network issues. Our DNS lookup test queries the root servers to find DNS lookup records detailing the path taken to retrieve the authoritative DNS server details. The authoritative DNS server returns the IP addresses associated with the requested DNS record. The result header contains general information about the test performed while the data in the tree shown below contains details about the actual DNS trace. 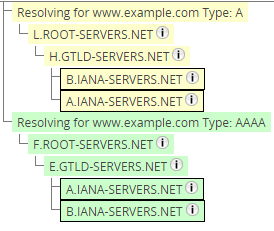 In this tree representing a DNS query, you can see the root server L.root-servers.net was first polled, which then sent the request to H.GTLD-Servers.net, and then to B.IANA-servers.net and A.IANA-servers.net. 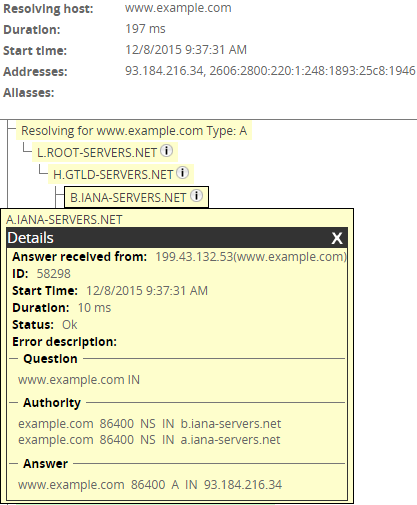 We have expanded the response from A.iana-servers.net to show you the details of the DNS lookup. You can see that the query in question was for the domain www.example.com, the authority result returned pointed to the two IANA A and B authoritative DNS servers, and the answer they returned was the IP address 93.184.216.34, which is hosting the site for www.example.com. The duration of 10ms listed in the response details from A. IANA-servers.net is the duration it took to receive a response directly from that node in the hop. You can see the duration from each previous node by clicking on the white information icon next to the name of the hop. If you are experiencing DNS issues from within your network, it is sometimes difficult to diagnose where the problem is originating from. The benefit of running free DNS tests from Dotcom-Monitor is that you can verify the results from a non-cached, external independent 3rd party. The DNS checker allows you to initiate DNS traces from dozens of geographically diverse locations around the world. This gives added insight into why certain regions may be experiencing DNS errors or other DNS problems. DNS records can be cached at a number of locations, from within your local machines DNS cache to any number of servers between you and the end server. To determine if there is a problem with your local cache there are two things you can do. First, you can view your local cache by outputting it into a txt file on your machine. To begin, create a directory in your C: drive called "DNS." Then open command prompt (typing "cmd" in the start menu search bar). Next, in the command prompt type “ipconfig /displaydns >> c:\dns\dnsoutput.txt" and press enter. This command will output the DNS table into a text file. Once you have done this, simply open the file that is now located in the C:\dns\ folder called dnsoutput.txt and you can then scroll through or use control+F to search to find the DNS record you are trying to reach. Next, run the DNS test on this page and compare the IP address in your DNS output file and the test. If the results are different you may need to flush your DNS cache and try again. To flush your DNS cache, in the command line, simply type “ipconfig /flushdns" and press enter. This will clear out the DNS table on your local machine and will force a DNS lookup. Alternatively, you could try using nslookup, also in the command line to perform a DNS query independent of your local DNS cache. Nslookup will return both the name and address of the DNS server that your machine connects to as well as the fully qualified domain name and the IP address it resolves to. This can also be compared to the Dotcom-Tools DNS trace results to figure out if the address is resolving correctly, and if it is not resolving correctly, what DNS server is giving you the bad results. There are 13 separate root DNS servers from a.root-servers.net through n.root-servers.net. These servers point DNS queries to TLD (top level domain) servers that handle requests to different TLDs like .com, .net, and .org. As a DNS lookup request is sent on, the address is parsed out in reverse order. So a DNS lookup to a domain name like www.example.com would first query the root servers for the trailing period that is implied, and then the TLD for .com, and so on, to the authoritative DNS server for example, and the subdomain of www.